Get ready for the "Red Blooded Rock N Roll Redneck Extravaganza Tour"!!! 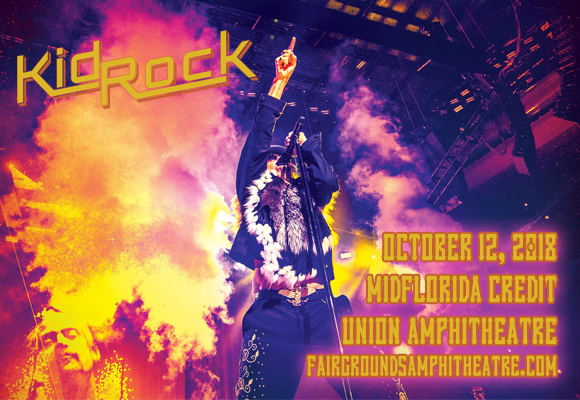 Featuring the American Badass himself Kid Rock, as well as support from country star Brantley Gilbert & country music comedian Wheeler Walker Jr., this country-rock-fest comes to MidFlorida Credit Union Amphitheatre on Friday 12th October 2018! Buckle up for a wild ride! American singer-songwriter, rapper, musician, record producer and actor Kid Rock began his professional career in the 1980s as a member of hip hop group The Beast Crew. Signing to Jive Records in 1990, releasing his debut studio album, Grits Sandwiches for Breakfast that year. Kid Rock had a major breakthrough into the mainstream with his eleven-times platinum 1998 album Devil Without a Cause, which veered from from the hip hop feel of his previous albums to the combination of country, rap and rock Kid Rock is now known for. All four of Kid Rock's studio album released between 2007 and 2015 were purely country oriented and featured Rock singing, rather than rapping. His return to rap came in 2017 with the release of his eleventh studio album Sweet Southern Sugar.